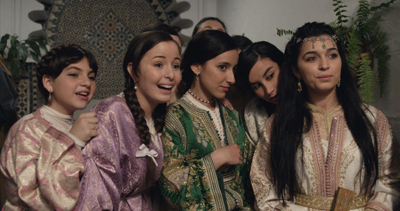 After the father’s death, Noufissa, a fifteen year old girl, and her mother, are forced to accept an invitation from a distant cousin to come live with her large traditional family. A keen friendship is forged instantaneously between the two young cousins. Then a great love story where Chama takes it upon herself to initiate Noufissa into the inner intimate world of women in the wide house. On this backdrop, other destinies are interwoven for other women in the family: Kulthum, the younger sister of Chama is obliged to interrupt her flirtation with her cousin, the same age as her, to get married to an old man that she does not love; other women long to leave the large family house to live more independently with their own children and husbands; other girls aspire to live a true love story like those they saw from time to time in an Egyptian musicals. So many dreams that remain within the walls of the large house where men, always absent, are only shadows and ghosts. These dreams seem distant and inaccessible, rather like a midsummer night’s dream in a large house where the only escape is a terrace, the only possible place open to the sky, life and the world outside. This terrace is a unique place of complicity and freedom and a secret garden for our two female characters. Although the trailer below has French subtitles, the film that will be screened has English subtitles.